After testing a 21-inch CRT monitor, I sometimes wonder, because of my aching back. But the effort of setting up such a mammoth pays off in some fantastic images. I was impressed by the color depth of the $1,900 Eizo FlexScan F980 CRT monitor from Eizo Nanao Technologies Inc. of Cypress, Calif. That's right, a $1,900 CRT. It's one of the higher-priced models on the market and also one of the best I've seen. I could find little fault with it except for the price. relatively light for a 21-inch CRT. The F980 sounds like the name of a high-speed motorcycle. It weighs 66 pounds and measures 19.4 by 19.1 by 20.5 inches, almost as big as a motorcycle. But even at 66 pounds, it's the lightest 21-inch CRT I've ever set up. 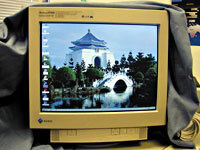 Even with dimensions larger than those of most large CRTs, Eizo has held down the weight. The faster the refresh rate, the less a monitor flickers and the higher the resolution can go. At its native, recommended resolution of 1,600 by 1,200 lines, the F980 redraws an image 100 times per second, for a refresh rate of 100 hertz. With maximum resolution up to 2,048 by 1,536 lines, the F980 diminishes the refresh rate by only 15 hertz, meaning the image is redrawn 85 times a second, still keeping flicker to a minimum. The quality extends not only to brilliant color but to sharp black-and-white contrast, particularly for text. Standing next to three high-quality, 21-inch high-resolution monitors on my workbench, the F980 took the cake in color depth and sharpness. It has one upstream and four downstream Universal Serial Bus ports. Configuration controls are easy to find and use. The F980 creates an image by shooting an electron gun through several differently designed filters onto triads of red, blue and green phosphor dots in an arrangement called Dot Trio. A shadow mask in front of the Dot Trio prevents leakage over to the next dot, and the SuperErgo Coat reduces reflection to keep images crisp and easy on the eyes. Even though the dot triad technology is common in CRT monitors, Eizo has refined it to a fine dot pitch of 0.23 millimeter vertical and 0.20 millimeter horizontal. Optional, attachable speakers cost about $100. I haven't been particularly impressed with attachable speakers for LCDs, finding them difficult to connect and of poor sound quality. 'much better than I expected, although visually they were't too appealing. Bigger isn't always better, but that sure isn't the case with the FlexScan F980.